What was the strategy used to secure Fort Detroit during the war of 1812? Outline the focus of your inquiry and provide background knowledge. Why is this an important and significant question to ask about the past? Provide evidence from primary and secondary sources. The focus of my inquiry question is to find out how British troops were able to secure Fort Detroit without any violence. When dealing with two major generals from each side, you would expect a big and bloody battle but the outcome of this was a surrender from the Americans. Because of the Manifest Destiny, shouldn’t the Americans feel superior to the people of Canada? They believed that it was their destiny to conquer all of North America, so why did the defenders of Fort Detroit give up so easily? Turns out, there’s a much more personal side to the Americans that I would come to discover with my research. The victory of Fort Detroit was an important win for the British and Indigenous people. This placed a setback on the Americans by losing one of their strongholds in Canada. Tecumseh also showed great intelligence from his strategy and Isaac Brock became a Canadian hero. By asking this question, we can see how a large historical conflict can end with no bloodshed. The letters from Hull and Brock are primary sources that show the relationship between the Americans and the British. Other online sources would say the same things. The Manifest Destiny made Americans believe that it was their destiny from God to conquer all of North America. After their success with the American revolution, they started to see how strong they were, thus leading to too much pride and confidence. From the Manifest Destiny, they made their goal to defeat all of Lower and Upper Canada but little did they know, Canadians were a force to reckoned with. After several attacks from the Americans, British General Isaac Brock needed a way for Canada to get an upper hand. His target was Fort Detroit but he would need support to be able to secure it. An Indigenous chief commanded many ambushes against American troops and from one of them, he retrieved a letter containing valuable information. The “battle” of Fort Detroit happened because the British needed an advantage against America. Tecumseh decided to ally himself and his tribes with Brock because he wanted revenge against America for taking his land. Tecumseh also made a bargain with Brock for them to give back his Indigenous lands from the Americans. It was a win-win deal for both sides. The consequences of this battle heavily sided on General Hull. The Americans lost a great stronghold and gave an advantage to the British. All of his men were captured and Hull was greatly disliked after. The outcome of the battle is fair by the values and standards at the time. General Hull surrendered from his own decision. Tecumseh and Brock’s strategy overwhelmed him to the point he couldn’t control his fear anymore and it ended in a fair loss for the Americans. Even if it was from our current values and standards, it would still be fair. Hull’s enemy was successfully able to turn his fear into their advantage and the results were completely understandable. What conclusions can you reach about your question, based on the research you conducted? 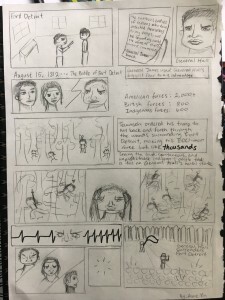 From the research I conducted, I discovered how Tecumseh and Isaac Brock composed a strategy against General Hull by taking information from the letter retrieved by one of the Indigenous people’s ambushes against an American troop. The letter was written by General Hull, explaining how terrified he was of Indigenous people. This was valuable information to Tecumseh and he used this knowledge to bargain with the British. 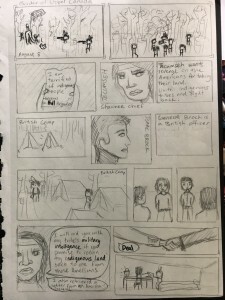 Tecumseh met up with General Isaac Brock at a British camp and stated that he would help him by offering his tribe’s military intelligence in exchange for the return of his Indigenous lands from the Americans. General Brock agreed to his deal and they started to construct a strategy that would dig deep into Hull’s nightmare. The first component of their strategy was for Brock to write a letter to Hull. He first asked for them to surrender Fort Detroit but when they refused, Brock declared, “the numerous body of Indians who have attached themselves to my troops, will be beyond my control the moment the contest commences.” That statement would then trigger Hull’s fear of Indigenous people and cause him to become mentally unstable. After that, they would send an army of troops to Fort Detroit and bombard the fortress with canons. With Brock pummelling the fort, Tecumseh would have his army of 600 men run back and forth through the woods near Fort Detroit. This made his forces seem massive and unpredictable. When General Hull would look out the window, he would see each fast-moving person multiple times and think they were a giant army. With this fear controlling him, his mental state was deteriorating and he finally snapped. Against the will of his 2,000+ men, General Hull surrendered Fort Detroit. It was a victory for the British and Indigenous without any violence. I would love to delve deeper into your fabulous work here, but it is quite difficult for me to read your scans. Do you by chance have a higher quality image? If not, feel free to bring the hard copy to me so I can look at it in tandem with this DOL.